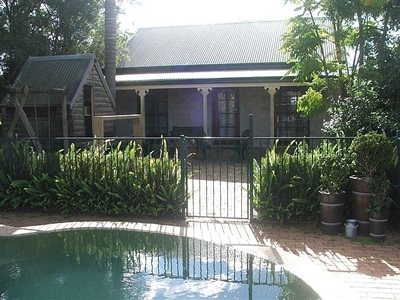 Kiah Retreat offers a genuine relaxing country break on a small Dexter cattle property at Kulnura. It features an air conditioned modern country cottage nestled amongst citrus and stone fruit orchards 3/4 hour from Hornsby. The cottage has a fully self contained kitchen. In the comfortable living room there is a coloured TV, video and small DVD library. The grounds of Kiah have relaxing outdoor facilities such as a swimming pool, barbecue, children's playground and peaceful gardens. We are nearby to Tennis and Golf courses, Trail Riding facilities and Koolang Observatory the Watagan and Ourimbah State Forest are both close by for the 4WD owners or bush walkers. Kiah Retreat also offers accommodation for horses with exercising arenas. From Sydney on the F3 take the “Wyong, The Entrance, Yarramalong” exit. At the top of the exit is a T intersection. Turn left. Travel along this road (Old Maitland Rd.) until it too reaches a T intersection. Turn left. 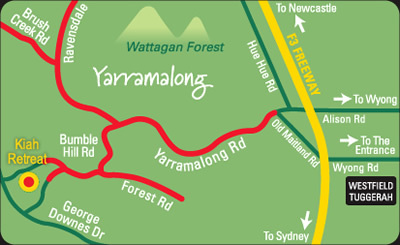 Follow Yarramalong Road until you reach the village (about 15kms) then turn left up Bumble Hill. Then turn right onto Greta Road. Finns Road is on the left.